The Aboriginal Education Department is pleased to announce our 2019 Aboriginal Role Models. Faith Madden and Jalen Edwards from Abbotsford Senior Secondary. Tyra Jones and Aiden Silver from Yale Secondary. Odyn Mulder from Abbotsford School of Integrated Arts Sumas Mountain. Marcie Pruden From Bakerview Center for Learning. 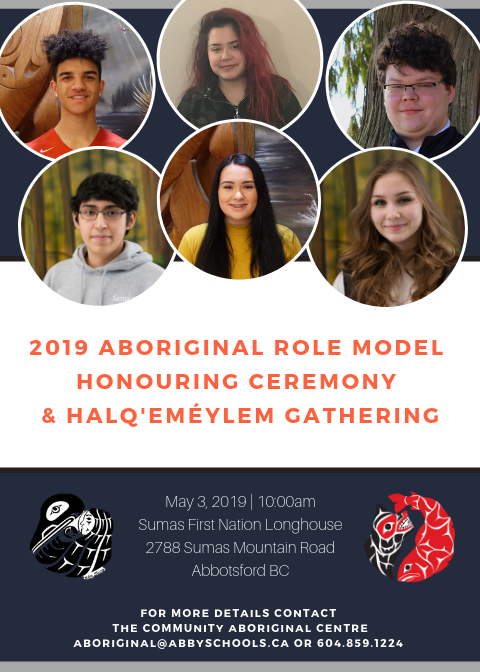 These students were selected from all the Aboriginal students in Abbotsford School District for their positive character, helpfulness towards others, leadership, academic achievement and their Aboriginal cultural pride.